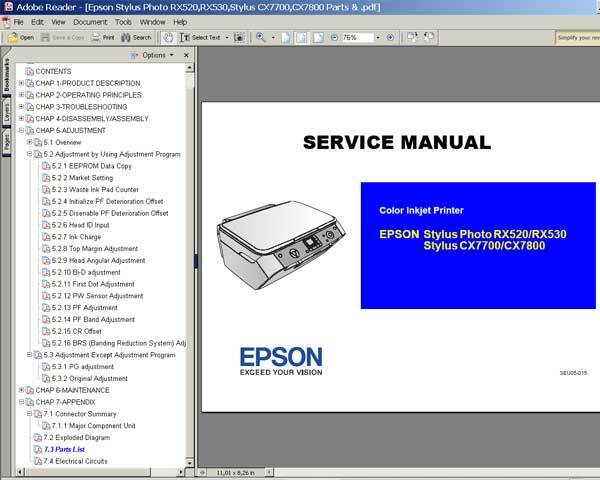 Home » Service Manual Catalog » EPSON Service Manuals » InkJet Printers » SM_RX520 I have paid for Reset Key but not received yet. me pueden ayudar con el reset de CX7700, CX7800 Service .. This Service Manual abd Parts List describes basic functions, theory of electrical and mechanical operations, maintenance and repair procedures of the printer. Thank you for the service. I have downlaoded my order.